Here is a list of the gear I brought with me to Virihaure and some comments. It was basically the same gear that I have been using for the last year or so. It was a 6-day trip that turned out to be colder than what I had reason to expect. So the gear was working at the limits of its capacity. I slept in everthing I had including rain pants (but not rain jacket) a couple of nights, but that meant I was not particulary cold at night. I hiked in my rain gear for 3-4 days even if it did not rain, in order to stay warm. There was no frost at night but around 4-5 C and an insistent wind day and night. So I was never in any danger and not even freezing, just close to being uncomfortable a lot of the time. Bottom line: The gear worked well and kept me in good working order. One important and impressive piece of gear was the 58 liter Gossamer Gear Mariposa Plus that I had only used before on the Vålådalen hike with members of Nordic Lightpacking in May. For that trip the pack was way too big and had no chance to really give much of an impression, except that it worked for a three day trip. This time with the packraft taking up volume and starting with 16 kilos on my back it was an exact replica gearwise an weightwise of last years packrafting endeavour between Abisko and Nikkaluokta. Morning of the second day with a fairly full Mariposa Plus. Full, but not bursting, I could probably have squeezed in food for another 2-3 days. For the Abisko-Nikka trip I used the ULA Ohm which I later reviewed and was satisfied with as a good compromise for the person who wanted a light pack and still needed some sort of frame within. Both Ohm and Mariposa Plus weigh between 650-700 grams and reputedly hold around 58 liters. And both have a frame of sorts. I cannot honestly say that I would need more of a frame ever. I found the Mariposa lots better for me than I found the Ohm. It is bigger inside (according to BPL and Roger Caffins articles ULA liters seem smaller than most due to the fact that they include the pocket volume) and fits more comfortably on my back, with the waistbelt a better fit around my hips. What I find not so good on the Mariposa is the elastics used to compress the main bag. I find them a nuisance that block side and back pockets when you need to start compressing after a couple of days. Ohm has a similar system but no pockets are blocked (since there are no pockets where the compression cord is). The Mariposa abundance of net pockets do suit my way of packing very well though, which makes them an improvement over Ohm, but alas, when you compress.... Oh well, there probably is no way around this, you cannot have black light. Comparatively the Mariposa fabric gives a weaker impression (true or false) than that of the Ohm and the general impression of 'finish' goes to the Ohm. All in all I prefer the Mariposa. New for this summer as well was the Marmot Trail Wind Hoody as well as the Marmot Essence 2010 (there are older version that are heavier) rain jacket and pants. The windshirt performed a lot better than my old Marmot Ion windshirt. The cut is much better for one thing (the Ion must have been designed for couch potatoes like Homer Simpson and not for tall and thin galoots like yours truly...). The new hood is excellent and the overall weight of the Trail Wind Hoody as well. I prefer a windshirt with a hood, since the few extra grams mean a lot of warmth in my windy mountains. 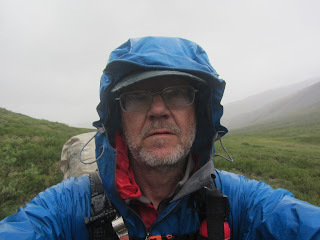 The rain gear from Marmot worked very well also. They have kept rain out all summer (there was no rain for more than five minutes on the Virihaure trip) and I walked in them for several days without having any trouble with condensation. I usually try to avoid putting on my rain jacket for as long as I possibly can, which is pretty long since I carry an umbrella. Two wool undershirts, windshirt, pants and rain gear (Marmot Essence) barely kept me warm in the cold wind blowing from the glaciers of Mt Sulitelma. I am really pleased with the Marmot Essence rain suit so far. And I have also for several years been favorably impressed by Marmots pricing here in Sweden. Their Ion windshirt was for a long time about half the price of windshirts from comparable brands. The MSR Titan Tea Kettle also worked very well. Expensive though. Using the light plastic bowl for lid and for eating out of as well also was a good solution. Improvised windscreen by Lake Vastenjaure, before packrafting. As you can see from the complete table of gear below (I am trusting everyone to be as nerdy as I am) I brough two pair of shoes. I have used Salmon Tech Amphibians in different reincarnations for many years now and they fit my style of hiking perfectly. I get along fine without very supportive and stiff shoes and need something flexible enough in the size department to handle everything from barefoot to pile socks underneath waterproof Goretex socks. But this time I also brough a pair of even-closer-to-barefoot shoes; Vivo Barefoot Evo Running Shoes. Finally, the BPL Thorofare pants has gone through the mill this summer and proven themselves worthy. They are very thin but windproof and with a bit of stretch. The leg pocket is a good place to keep your money when you are in civilized surroundings. They have so far not shown any holes in spite of some bushwhacking. They dry out extremely fast after fords; I can seriously say in a couple of minutes. With the DWR it is almost as if they do not get wet. We'll see what happens after they have been laundered some more. The 120 gram Thorofares to the right have replaced my homemade, five year old 170 gram blue Pertex pants. The latter ones have truly been through the mill and seen a lot of bushwhacking. I have certainly walked more than 1000 kilometers in them, a lot of it off trail. No holes and some sign of wear without being worn. Something for people that claim that thin fabrics are torn to shreds when you step into the brush to chew on. This is a fascinating read and I really enjoyed the gear list too. How do you find using an umbrella though? I've noticed only a few people here in the UK using them on hikes, so would appreciate your thoughts. I think you forgot base layer in 'cloting worn'. Why both neoprene and gore tex socks? 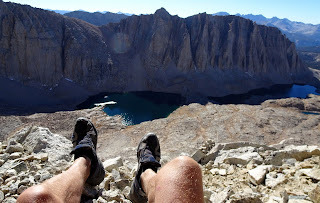 i.e, why not use the gtx socks for packrafting or neoprene for hiking? I'm glad you liked your Mariposa Plus. I also feel the compression features are a bit lacking, but I've found an acceptable solution in that I attach carabiners to the side bungy attachments and use them to hook up with the opposite attachment. It doesn't solve the pocket issue though, except for the high pocket on one side. Maybe a better solution would be to add some attachment point for a hook on the bottom ice-axe loop. Yes, I did! Luckily enough only on the list and not on the mountain. My base layer is the Kent merinowool shirt. I will add it to the list shortly. Good idea. I will probably use the Mariposa next summer as will, and will tinker a bit. I'd like to echo the comment made by Mattias about the neoprene and GTX socks. Is it necessary to carry both? And if neoprene socks are useful (I'm guessing they're required for their 'warm when wet' function) would a pair of neoprene gloves be useful too? Sorry, forgot to answer that one. Both socks and shoes are doubles for testing. I would normally only carry one pair of each. Since I was packrafting I knew that neoprene socks are better for when you regularly immerse your foot. Always a risk that water runs over the top and into the sock. I also wanted to test hiking in neoprene socks as an alternative to my wet feet/waterproof socks aproach. I'll write about my findings in a while. A pair of neoprene gloves would probably have been nice, or a pair of Sealskinz that I actually have but did not bring. However, my experince of neoprene gloves is that it is sometimes warmer without them. Depends on temperatures of air and water I guess. I can see the reasoning behind the neoprene socks. There is a high probability that they will get wet being in the bottom of the packcraft, even with a spray deck. I've read elsewhere of people coping with GTX over-mitts on their hands, with the cuff tightened on the outside of the rain jacket as the wrist is more often than not above the elbow allowing water to run off the sleeve. Sealskinz though I can't bring myself to use. I've tried the socks and gloves and found them extremley difficult to dry out. Actually the biggest challenge is to get in and out of the packraft without getting your feet wet in the Goretex socks. Neoprene was much better; that is the keep your feet warm when wet. About the hands I did not find it awkward while paddling, only when I got to the shore and tried to use them for more delicate things than swinging a paddle. Most of the time I also paddled in only my rain gear and windshirt, which did get a bit wet. No problem as long as I was paddling, but pretty cold when I got out of the packraft. I would say that neoprene socks make more sense then neoprene gloves. Since the chance of getting your feet wet in most cases are higher then for your hands, a sock that still functions when wet (like a neoprene one) would be preferable. I have been using neoprene socks when hiking and biking with great success, and looking forward to try them out for rafting. Gas Canister 155 gms, is that half a container or ? I must admit that I was very impressed with gas consumption when I was in Lapland over summer. The only challenge is 3 weeks which probably means 2 canisters or one canister with a wood stove. Have you retired you OZ pullover? I have finally been able to get a pair of Salmon Tech Amphibians in my size (very big) I like them and will probably take them on my next trip up north for river crossings etc. It is the medium size canister at 155 grams empty. The gas itself is added among the consumables. For three weeks I would probably bring two medium canisters and the small one as a backup. I find the very largest canister a bit tippy. The Oz is retired, but not because it was ailing. I simply got the chance to test the Essence. The Oz has a better hood and I actually prefer the pullover type. It is also a bit stiffer, the Essence is more pleasantly soft. Good luck with the Amphibians. If it is one thing I have learned it is how personal shoes are. It seems most people find the Amphibians to 'loose' and soft. I marked my Titan Kettle with the end of a screwdriver. It's pretty permanent! I have discovered that some things are missing in my gear list, it is not quite as austere as it looks. One thing missing is a Cocoon Pullover, another a 'blood-stopper', heavy duty bandage courtesy the Swedish Armed forces. I'll check the list ASAP, which is probably tonight. OK, now I have checked the gear list against the original Excel. I must have screwed up somewhere in the process of copying it to an html-editor, editing it and so on. It was soon discovered that I had managed to mislay my Icebreaker Kent at 220 grams. Today I also found that a very important piece of gear was not on the list; the warm jacket a BPL Cocoon Pullover. A favorite piece of gear and something I would never go without in the mountains. 316 grams for that one. Also sadly mislayed was a piece of medical gear; a blood stopper originating in the Armed Forces. It weighs 42 grams and contains gause and cloth designed to stop massive bleeding. I have carried the likes of it for 35 years and never needed it. This has added about 675 grams to the original list. I hope I have all sums right now. Sorry about this. Luckily I am more careful when actually packing my stuff. Hi... I thought the Marmot Essence was discontinued? I haven't seen it on their website in 2010. I checked with the Swedish agent and they say it is not in the fall 2010 catalog, but in the spring cataoog for 2011. Updated version that is 20 grams lighter and 'breathes' 50% better. It is stated 5500 g for food and fuel - can I ask you to be a little more specific? It would be very interesting to see a list. Thanks in advance!